One of our stops during our honeymoon in Indonesia was Yogyakarta on the island of Java. As for staying gluten free in Yogyakarta… mission accomplished, allow me to present my gluten free yogyakarta guide! Yogya has amazing smoothies and gluten free cake to be discovered. 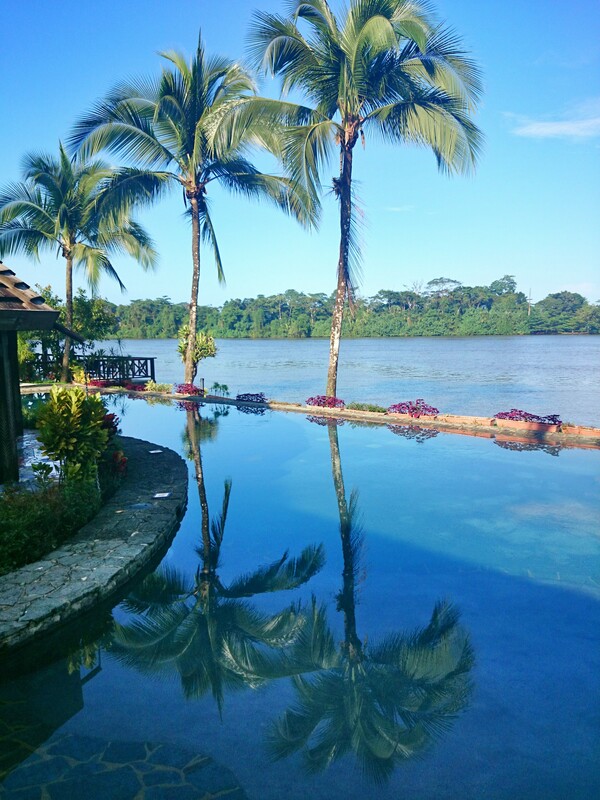 Once again, we had extremely helpful hosts – notifying people in advance of your stay and then giving them an Indonesian language restaurant card from www.celiactravel.com works wonders. Exercise the usual coeliac caution and you’ll be fine. Below I have listed some of our gluten free finds. For more info on being gluten free in Indonesia, see my Bali, Gili Air and Sumatra gluten free guides. Via Via – all hail the gluten free cake! What a find in Yogyakarta, gluten free cake from Via Via bakery. A flourless chocolate cake, they even store it in a separate Tupperware box in the fridge, away from the other cakes. As you can tell, I was pretty excited to try this. 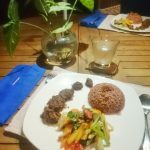 Yabbiekayu – we stayed in one of a number of beautiful traditional Javanese teak houses on the outskirts of the city, at Yabbiekayu Homestay, surrounded by paddy rices. The staff were so helpful about keeping things gluten free for me and they stuck my restaurant card up in their kitchen. 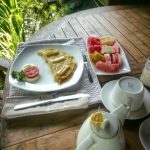 We ate breakfast and dinner with them almost every day and they really are a star of gluten free Yogyakarta in my opinion! One of the dishes they made for us to try, was the naturally gluten free and dairy free dish Bubur Sumsum. 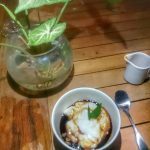 It’s a delicious Javanese sweet porridge made from rice flour, coconut milk and pandan leaf, served with a sauce made from brown sugar and corn flour. This is definitely worth a try if you get the opportunity. I really could wax lyrical about Yabbiekayu. They were wonderful with my dietary requirements and even made gluten free beef rending for me, which was also probably the MOST DELICIOUS rendang I have ever eaten. Rich, coconutty and full of fragrant spices. For an early morning temple trip Yabbiekayu gave me a nice gluten free packed breakfast of yoghurt and fruit to go with my sachet of Eat Natural granola. Just Juice – yummy smoothies and milkshakes – cute trendy café and perfect for a pit stop.